Mater Dei Student Anna Culleton talked to The College View about how it feels to be part of the parade which is the centre of the St Patrick’s day Festival each year. The Wexford native is in first year studying English and Religious Education. 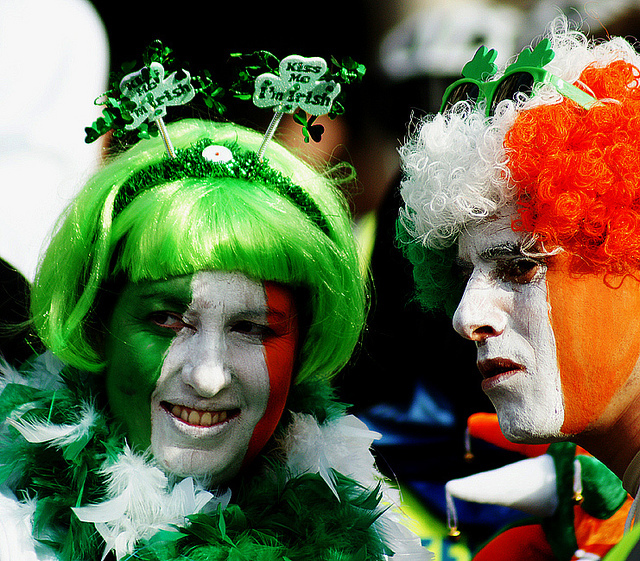 “Every St. Patrick’s day since 2008, I have seen the Dublin parade from the inside out. What I see every St. Patrick’s Day is hundreds of thousands of faces, staring at me. I see excited children, poking their arms through the barriers trying to get a performer to high-five them. I see amazed tourists with their cameras flashing; trying to capture every moment. I see Dublin locals hanging out of windows, waving flags and drinking Guinness. As performers we don’t get to see the parade, we are the parade. St. Patrick’s Day has never been about drinking for me. On the morning of the parade all the performers meet to get a bus at six in the morning. Being hung over or tired is just not an option. Running and dancing with a prop strapped to your back for three hours takes all your energy, and by the end of the parade every muscle in your body aches. I have been performing in parades for 6 years now, and St. Patrick’s Day is undoubtedly the one I look forward to most. I am part of a street theatre company in Wexford called Bui Bolg, and have been lucky enough to have been part of workshops and training to help improve my performing skills and confidence. Every year they design the floats and costumes; they plan the theme and train young people into the roles of different characters. I have been a flower, I have been a horse, I have juggled and I have roller-bladed in parades. This year I was a dancing “flame” in the Cork parade. There is a satisfaction from performing in front of tens of thousands of people that is inexplicable. Every year, there is an exact spot on the parade route when I pause, stop the façade; forget the character I am supposed to be for just a moment, and allow myself to be blown away by the experience. Just as the parade moves past Christ Church, the road widens, the crowds get bigger, and suddenly I’m aware that I am standing on top of Dublin on St. Patrick’s Day and the world is looking in my direction. A sea of green is waving at me and cameras are flashing, and very quickly I have to get back into my character, whatever it may be and continue entertaining the audience.